Click below to continue going to Chris DeLong’s support page on the World Outreach website. 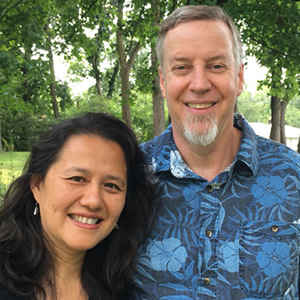 Chris and Wendy DeLong met at Christ for the Nations Bible College in Dallas, Texas. Wendy was there as an international student from Singapore. After graduation they got married in 1997 and moved to Asia three years later. Chris then became an international student while studying Mandarin at two different Chinese universities. Once he completed language studies they started a coffee house with a vision of doing business as mission. This allowed them to be friends with locals and live out their Christian faith through friendship evangelism, personal discipleship of believers and have opportunity to develop both church and business leadership. They ministered there for 17 years before moving back to Indiana in 2017. Chris and Wendy have 2 children, Isaiah and Carissa whom they love very much. Isaiah and Carissa grew up in Asia and have now jumped into the next season of their lives. Isaiah will soon enter university and Carissa will soon enter high school. Beyond living in Asia for these many years, Chris and Wendy have both traveled to numerous countries for different lengths of time and gotten to know people from many different cultures. They see the experiences of the last couple of decades preparing them for the work they do now. They are working with international students on university campuses. Chris is the City Director of Fort Wayne, Indiana for International Friendships Inc. His primary role is to recruit, coordinate, train and lead the City Impact Team. They want to welcome international students and help them feel at home in the U.S. We also have a hope that, as a family and the IFI team, that we can live lives that honor the Lord and help model the life of God for internationals so they have an opportunity to come to know Him.